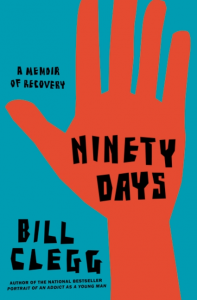 90 Days, A Memoir of Recovery by Bill Clegg is a short novel that packs a lot of drama into an easy-to-read 194 pages. A follow up to his Portrait of an Addict as a Young Man, Clegg painfully details the many relapses and missteps along the way to finally achieving 90 consecutive days of sobriety. It's a clear and convincing story of the possibility of recovery. However, it paints a humbling picture of the many challenges one will face on this journey. Clegg's drug of choice was crack. Before he started abusing it he was a hotshot young literary agent who represented famous authors, had plenty of friends and co-owned his own agency in New York city. After his addiction started to take its toll he basically lost it all and burned many bridges along the way. However, Clegg was extremely fortunate in still having a few resources to fall back on in addition to his skills as a writer. A prepaid gym membership gave him something to help fill his days and one angel of a friend left gourmet groceries on his doorstep ever week. He managed to beg and borrow enough to pay the rent. Given this gift of time, he was eventually able to acquire the wisdom to start on his path to sobriety. My sobriety, that delicate state that can, for years at a time, feel unshakeable, is completely dependent on my connection to other alcoholics and addicts, my seeking their help and my offering it. . . . "
This book should serve as a valuable addition to the canon of literature about addiction and recovery. It provides an unflinching, yet ultimately sympathetic depiction of the humanity of those struggling to recover from addiction. It also proves that even frequent relapses are just part of the process and not unalterable failures. 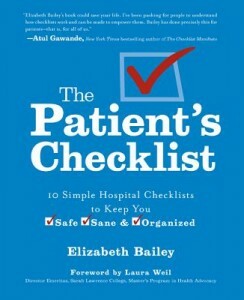 Elizabeth Bailey's The Patient's Checklist is more than a book. It is a tool to empower those who are facing a stay in the hospital and the families who want to support them. The book starts with a horror story. The author's experiences will surely frighten anyone facing their own or a family member's hospitalization into becoming better prepared for what awaits. The author's 81 year-old father went from an active and independent life to an ordeal of steroid induced psychosis, a one-month stay in the hospital and a disastrous commitment to a psychiatric hospital. This completely preventable chain of events started with an incorrectly prescribed medication and was exacerbated by incompetent and uncoordinated medical treatment in the hospital. While he eventually recovered, his remaining quality of life was diminished needlessly as a result. This experience led the author to create a series of checklists to help families and patients navigate the hospital experience. There are many special checklists including ones for before the patient enters the hospital, what to bring, medications, insurance etc. Since the experience of hospitalization is stressful for all involved, these checklist should prove very useful in helping to ask the right questions and keep track of the many things that should be documented. Unfortunately the excellent content of this book is delivered in a somewhat shoddy package. The first page of the review copy was half off its spiral binding. The cover is made out of a flimsy cardboard that was already a bit dented in shipping. This is unfortunate, as this is the kind of book that is meant to be carried around and used instead of sitting safely on a bookshelf. I would recommend taking a few minutes to cover the book in clear contact paper to protect your investment in this useful book. Jonathan Gruber, HP Newquist and Nathan Schreiber's new graphic novel is entitled: Health Care Reform: What It Is, Why It's Necessary and How It Works. Its goal is to explain the basics of the Affordable Care Act (ACA). It does a remarkable job of combining text and images to bring much needed clarity to abstract and complicated issues. This reviewer was able to get through the entire book in approximately 90 minutes. Some reviewers on Amazon complain that the book is a propaganda piece for the ACA. While it is clearly in favor of the act, the book does address in detail many of the criticisms and uncertainties that its implementation will entail. It makes a thoughtful case that while some aspects will need to be tested and revised, it still makes sense to support and go forward with it. The book also explains not only what "individual mandate" means, but why it is so important to the Act's potential effectiveness. This long overdue book is highly recommended and will hopefully contribute to more reasoned and informed discussion about the future of health care in America. This is a pretty little book whose insights about leadership are delivered in an easy to digest 78 pages. It has been definitively established that addictions treatment organizations are facing a severe shortage of adequately prepared leaders. While the author is not specifically coming from a behavioral healthcare background, many of his bountiful little nuggets of wisdom apply to leadership generally. The author's path to leadership was untraditionally. He thought he was on a fixed career track as a professor at MIT when he was quite unexpectedly recruited to be the President of the Rhode Island School of Design. He believed that "a creative leader is someone who leads with dirty hands, much the way an artist's hands are often literally dirty with paint". So in order to better understand the organization he was to lead he actually immersed himself in the day-to-day workings of the school firsthand by doing such tasks as serving food at the cafeteria and carrying the luggage of new students. However, he came to understand that the downside of being a 'dirty-hands' leader is that you risk 'taking away the work that's to be done by the people that you lead." He also recommends having the courage to acknowledge what you don't know, declaring that: "competency results in success results in complacency results in failure results in learning how to be competent again." Leaders need to be able to welcome criticism and receive it with grace in order to improve. This little book will provide much food for thought for leaders at any stage in their professional development.